Scientists are teaching robots to say 'No' to commands. Is that a good thing? Above all else, it seems, a robot must obey a human at all times, except when such an order might harm a human. Researchers at Tufts University Human-Robot Interaction Lab, however, use their own set of rules – one where robots can reject a command. That sounds like the plot for a bad movie about human annihilation at the hand of artificial overlords. The first three are self-explanatory. The forth condition basically says “can I trust you? who are you to tell me what to do?”. The fifth rule says “OK, but if I do that do I break any rules? 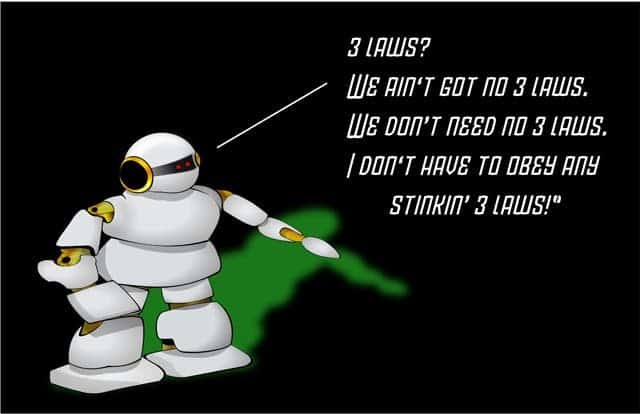 (civil and criminal laws for humans, and the possibly an altered version of Asimov’s Laws of Robotics for robots). In the videos below, Tufts researchers demonstrate their work . First, a robot set on a table is ordered to walk over it.The robot registers however that by doing so it would fall off and possibly damage itself, so it rejects the order. The researcher, however, changes the framework by telling the robot “I will catch you”, then the robots amazingly complies. It’s worth noting that the robot didn’t have these exact conditions preprogrammed. Natural language processing lends the robot a sort of understanding of what the human means in a general way “You will not violate Rule X because the circumstances that would cause damage are rendered void”. Next, the robot is instructed to “move forward” through an obstacle, which the robot graciously disobeys because it violates a set of rules that say “obstacle? don’t budge any more”. So, the researcher asks the robot to disable its obstacle detection system. In this case, the Felicity condition #4 isn’t met because the human didn’t have the required privileges. In the final video, the same situation is presented only now the human that makes the command has the required trust necessary to fulfill the command. Could in the future robots become the ultimate ethical agents? Imagine all the virtues, morals and sound ethics amassed through countless ages downloaded inside a computer. An android Buddha. That would be interesting, but in the meantime Tufts researchers are right: there are situations when robots should disobey a command, simply because it might be stupid. At the same time, this sets a dangerous precedent. Earlier today, I wrote about a law passed by Congress that regulates mined resources from space. Maybe it’s time we see an international legal framework that compels developers not to implement certain rules in their robots’ programming, or conversely implement certain requirements. That would definitely be something I think everybody agrees is warranted and important – if it only didn’t interfere with the military.